A solution to one of insulator collecting's most annoying little problems. Hey there Muncie and Coolie Hat owners. Tired of that annoying and sometimes unnerving "grinding" noise you get when you monkey around with one of those big insulators? Want to have a little peace of mind for the entire cost of 5 minutes of your time? Then you need the Munch-B-Gone Safety Washer. Here is how you can make the washer (an "insulator insulator"), and how to install it. 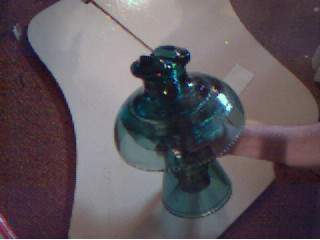 A Muncie, Coolie Hat, or other two-piece insulator. 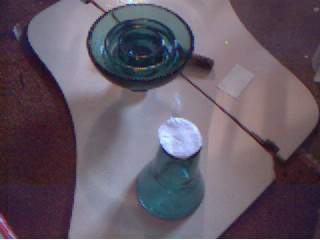 Toilet tissue, felt, an old business card, or other thin, fibrous material. A couple of spare minutes. 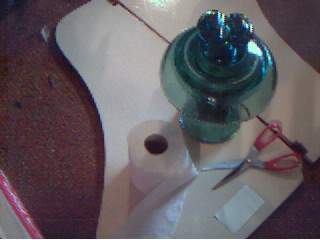 Take your insulator apart, and lay top & pin aside. than the top of your insulator's sleeve or lower half. 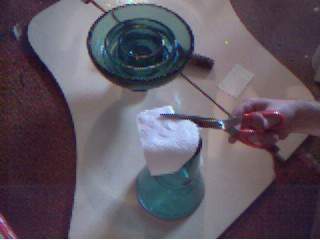 If you're using toilet tissue, place 4 or 5 sheets together before cutting. 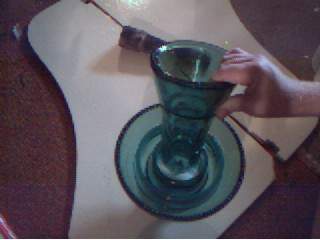 Cut a smaller circle out of the piece now, so it looks like this. hung up on the threads. The ring does not need to be perfectly-shaped. 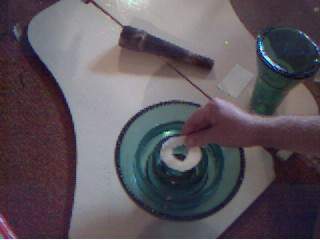 Lay your Muncie or Coolie Hat top upside-down and place this ring in the center. 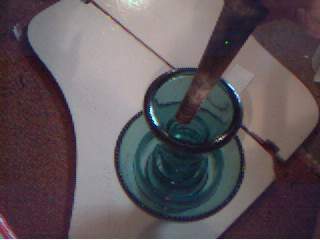 Place your insulator's sleeve back in, noticing how quiet the two pieces now mate. Screw in your pin. Listen. Hear that? Of course you don't. No more grinding of glass on glass anymore. Isn't this great? No longer should you be afraid to pick up your Muncie. Although this modification is meant to ease the minds of new Muncie and Coolie Hat owners, anyone who is bothered by the sound of glass grating on glass anytime they pick up or move their Muncie might find some solace after installing the washer. 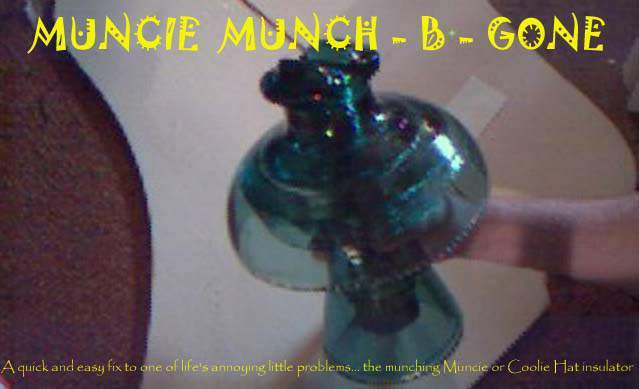 The newly-installed Munch-B-Gone helps tightly secure the two halves of your insulator, and prevents them from rotating and grinding together when the insulator is moved. Need to clean your Muncie or Coolie Hat? The washer will simply slip right out; then just clean your insulator as you normally would. When properly installed, Munch-B-Gone is completely invisible and will not detract from a display when the insulator is displayed on its pin. If you don't wish to make your own, you can purchase rubber "union washers" for compression fittings in any plumbing store or in the plumbing section of a hardware store. According to the person who wrote in, buy the 2" outside diameter washer for CD190/191 tramps, and 2 3/8" for Muncies & Coolie Hats. Install them the same way you see the homemade version being installed above. NOTE: Munch-B-Gone is not endorsed or approved by the NIA... not yet, anyway.